Even starting out as engineers in Calgary’s oil fields, Rob and his wife and business partner Michelle Avis knew their careers lay in creating solutions that would heal the land….and after just 10 years, they have reinvented themselves in a way many professionals only dream of doing. Rob and Michelle left the oil and gas industry in 2008 and launched Verge Permaculture, now an internationally-recognized and award-winning regenerative design, consulting, and education center. Through Verge they are leading the next wave of permaculture education, and teaching career-changing professionals how to build successful businesses combining technology with earth science and eco-entrepreneurism. Leveraging their 20 years of combined experience in engineering, project management, ecological design and sustainable technologies, Rob and Michelle Avis started their consulting firm, Adaptive Habitat in 2015 – a unique and leading edge property design and management company. As skilled Professional Engineers, they offer a depth of practical expertise in building science and appropriate technology (solar, wind, combined heat & power), as well as rainwater harvesting, agro-ecology, ecosystem engineering, soil regeneration and onsite wastewater treatment / septic design. Rob and Michelle have studied regenerative design internationally, interning at the pioneering Nordic Folkecenter for Renewable Energy in Denmark; researching sustainable farms, eco villages, and renewable energy installations from Calgary to Latin America; and completing three permaculture certifications in the US, Australia and Canada. Rob later spent three months volunteering at the Australian Permaculture Research Institute and became one of its first certified teachers. Since then, he and Michelle have visited many of the world’s leading permaculture sites, and brought many internationally-known teachers to present at Verge. 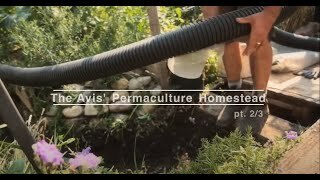 With ongoing training and practice in dozens of sustainable technologies ranging from natural building materials to greywater systems, wind turbines to soil and wetland restoration, they’ve converted their urban Calgary home into a living permaculture project complete with a front-yard food forest, water-harvesting features, passive solar greenhouse, and energy retrofits on the house. Since launching Verge, they’ve helped more than 1000 students and a growing number of clients design and/or create integrated systems for shelter, energy, water, waste and food, all while supporting local economy and regenerating the land. In keeping with Verge’s mission to grow the permaculture groundswell, Rob donates much time as a popular and passionate public speaker for community events, non-profit groups and businesses. He has been invited to lecture at local colleges and universities, and to speak at both regional and international conferences. They have earned testimonials from permaculture’s bestselling author Toby Hemenway, dryland-restoration guru Craig Sponholtz, and “beyond-organic farming” superstar Joel Salatin among others. Leading permaculture designer/trainer Geoff Lawton calls Verge “one of North America’s premier permaculture design and education companies!”. Rob finds balance in his life by spending free time outdoors with his wife and two children, and by devoting time to his meditation practice. In his odd extra moments, he can be found tinkering in his shop, cooking up a new recipe in the kitchen, picking out chords on his new guitar….or jotting down notes on his latest entrepreneurial idea. Michelle is focusing her time and energy primarily on the couple’s two young children, while growing microgreens, sprouts, herbs & veggies in the Verge greenhouse and gardens. An avid swimmer, she also enjoys long-distance cycling in the summer. We engaged Rob Avis from Verge Permaculture to speak about passive solar greenhouses at SESA's 2014-2015 Solar Seminar series. Rob is a dynamic, informative speaker who clearly knows his subject matter. As an engineer and an ecologist, Rob offers a unique and refreshing perspective. We would be thrilled to host him again in the future. Rob and Michelle, the owners and creators of Verge Permaculture, have done an amazing job in permeating the ideas of permaculture to our class. They are personable, knowledgeable and pragmatic in their approach and I would recommend that anyone who has an interest in any of the information offered by them access and support their diverse ventures in creating a better world for us all. Rob is a great teacher and some how he managed to cram so much into my head in such a considerably short time while not making me feel overwhelmed and making sure I and everyone else understood. Passion is clearly visible in [Rob's] teaching. Great blend of philosophy, technical knowledge and practical hands-on experience. All of the videos, photos, anecdotes, etc. make for an interesting and engaging presentation. 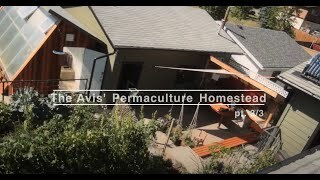 What does permaculture look like in real life? Nestled in southeast Calgary is one of the city’s original thriving permaculture projects – our home! As engineers and long-time permaculture designers and teachers, we’ve traveled the world to learn about sustainable and regenerative human habitat and have implemented many of these concepts on our property. 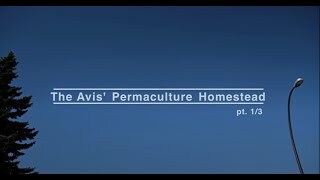 We’ve been transforming our inner-city home into a permaculture demonstration site since 2009, and are proud to use this video series to show you what we’ve done! • And mega-productive veggie gardens (with wicking beds and swales)!